The Queen of Celtic Music is coming to Budapest 2019! Spiritual ancient voice in our modern days! Probably not on my own by saying Loreena McKennitt the multi-award winning Canadian singer-songwriter and musician is not only known in her homeland, but even from Pine Island – USA to Melbourne – Australia and throughout the world thousands-and-thousands enjoy her eclectic Celtic pop music. She has performed in some of the world’s most-respected and historic concert venues, from Carnegie Hall to the famous Alhambra Palace in Granada, Spain and for dignitaries including Her Majesty Queen Elizabeth II and numerous Head of State. 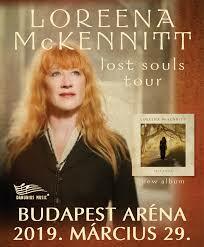 She will be on tour in Europe with her “Lost Souls”, which is in line her 10th album and released last year in May. Within her Lost Souls tour will give 24 concerts in 8 countries, arriving on March, 29. 2019. – Papp László Budapest Sport Arena from 8 p.m. Those who have already heard her music know very well that she brings lyrics into her songs of John Keats and W.B.Yeats poetries. Also a mighty influence evokes from Middle Eastern rhythms sound in her songs. On Loreena McKennitt tour will be accompanied by Brian Hughes guitars, Arabic lute (Udon) and Celtic bouzouki, cello Caroline Lavelle, Hugh Marsh violin, double bass and Robert Dudley Philips Brian percussion. Ms. McKennitt have had already 14 million record sales worldwide. Recordings of Gold, Platinum and multiple platinum status in 15 countries on 4 continents. She was nominated twice for Grammy and twice for the Juno Award and once for the Billboard International Award for Recognition. In 2013 was appointed „Knight of the National Order of Arts and Letters” by the Republic of France. In 2004, McKennitt was awarded the „Order of Canada”. During the Fall the “Lost Souls” tour continues in Brazil, following in Argentina and Chile. The organizer of the Budapest concert is the Danubius Music Production Office. A great opportunity to see a rising star….Don’t miss her…..Chris from downunder.